The 2018 Winter Edition of the Grassland Gazette is here! 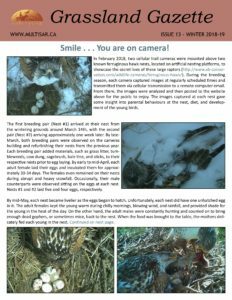 The 2018 Winter edition of the Grassland Gazette features our ferruginous hawk camera project that was undertaken in the spring of 2018. Read about the cameras placed on two ferruginous hawk nesting platforms, which captured amazing shots of nest building, egg laying and young rearing over the spring and summer months. Also featured in this edition is the Silver Sage Conservation Site, owned by the Alberta Conservation Association and Alberta Fish and Game Association. Learn about some of the projects that have been undertaken on this site, including native grass restoration, shrub planting, off-site watering and wildlife friendly fencing. And finally, read up on one of Alberta’s rarest plants, small-flowered sand verbena. This is a Threatened species in Alberta that grows on sandy soils and active dunes in the southeast corner of the province. Read the complete Winter Edition of the 2018 Grassland Gazette here! ©2019 Copyright MULTISAR. All Rights Reserved. All photos ©MULTISAR staff, except where noted otherwise.